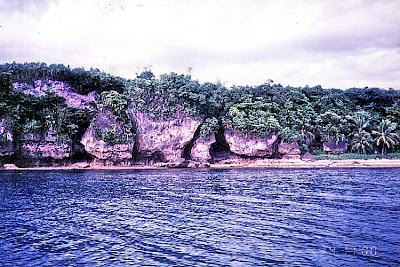 Come Monday, I decided to do some island hopping with a 1-day excursion to the 5 sq. km. 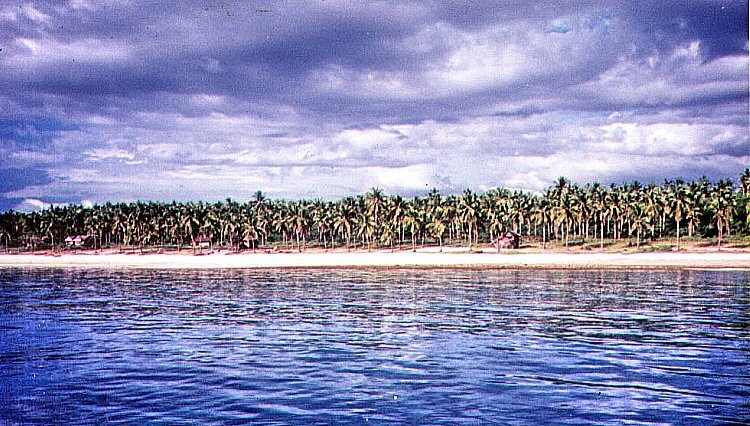 Higatangan Island in neighboring island province of Biliran. I was accompanied by Jandy and a guide and translator, Mr. Narciso “Noknok” T. Villamor, a product specialist from Pharmacia & Upjohn referred to me by my sister-in-law Paula. After a very early and heavy breakfast, we left Tacloban City on Noknok’s car by 8:30 AM, bringing with us a picnic basket packed for us by Paula. Along the way, we passed by the Leyte towns of Palo, Sta. Fe, Alangalang, Jaro, Tunga, Carigara, Capoocan and Leyte before stopping for a photo session at Biliran Bridge over the narrow Biliran Strait which connects the island to Leyte. 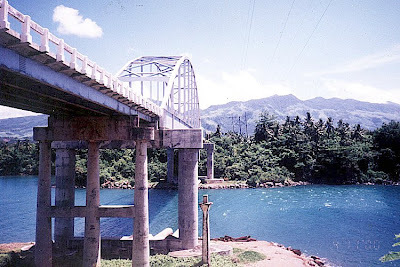 After crossing the bridge, we continued on to Biliran town and then to Naval. The road going there was surprisingly smooth all the way. After a 2-hr. (123-km.) trip, we finally arrived at Naval, the provincial capital and largest town, by 10:30 PM. We first parked our car at the parking area of the town’s church where Noknok, a former seminarian himself, had some priest friends. We then hailed a tricycle, loaded our bags and picnic basket and proceeded to the port. There was only one scheduled, 25-30-pax boat going to Higatangan Island which was to leave by 12 noon. The boat would return to Naval at 7 AM, the next day. Fare was PhP15 per person for the 1-hr. trip. The boat was still loading people and large sacks when we arrived at 11 AM. We took our seats near the prow and while waiting we befriended Ms. Bebie Balatero, a lot agent working in Naval and a resident of the island. She willingly agreed to guide us around the place. From the port we could espy, from a distance, Dalutan Island and Capinahan Island, all within the jurisdiction of Almeria town. 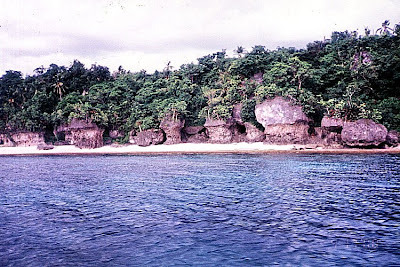 Dalutan, we were told, has a small stretch of white sand beach naturally pocked by sea-sculpted boulders on both sides. We departed the port at 11:45 AM and arrived at the island a little before 1 PM, landing at the cresent-shaped white sand beach of Brgy. 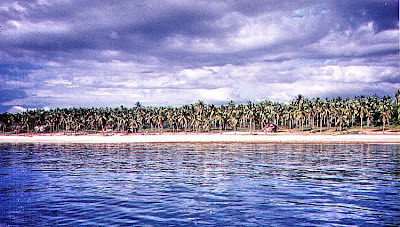 Libertad, one of the islands 2 barangays (the other is Mabini). 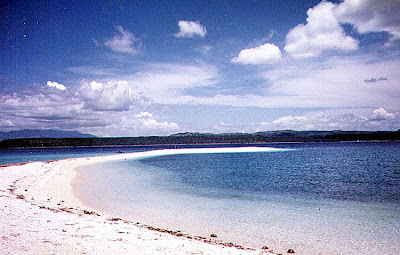 A short distance away was a beautiful white sandbar which extends 200 m. to sea. It periodically shifts; found near Higatangan’s tip one day and near the other the next day, thanks to the action of wind and changes in sea currents. The beach has a number of picnic huts and the island’s only resort, Limpiado Higatangan Beach Resort. 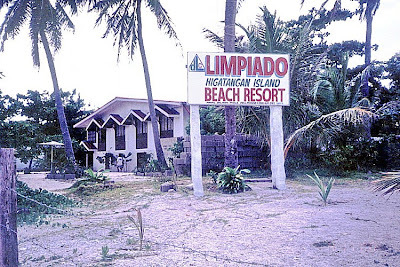 The late owner of the inn, Fidel Mahinay Limpiado, Sr. (who was born on April 24, 1892 and passed away on May 25, 1981) was the founder of the Higatangan Evangelical Church of Christ, the first Protestant church and mother of all UCCP churches in Northern Leyte. Jandy was excited about swimming and snorkeling at the beach, even under the hot noontime sun, and was soon down to his trunks. Noknok and I soon followed suit. We also got one picnic hut for ourselves and our things. All of us took our first dip in and around the sandbar. Later, I decided to comb the beach for shells and was able to pick a presentable spider conch. Fearing a nasty sunburn (what little sunblock lotion I had was reserved for my son), I rested at the picnic hut and couldn’t help but notice a man talking continuously, without letup, to a boy who was reading a magazine and seemed oblivious to what the man was saying. Later on, the boy left but the man kept on talking, if only, to himself. Noknok noticed him too. Anyway, I thought to myself, he wasn’t hurting anybody and so, I ignored him and left him to his own devices. After 30 mins. of delightful swimming and beachcombing, we remembered that we haven’t eaten lunch and we all settled down to partake of what Paula packed for us. In the picnic basket was spaghetti, a lechon manok, sliced roasted lechon, rice plus my favorite tipay (scallops baked with garlic). In addition, we had ripe mangoes for dessert and bottled water and canned soft drinks to wash it all down. We invited Bebie plus the manager of the inn to join us and pretty soon, although shyly at first, were also partaking our fare. 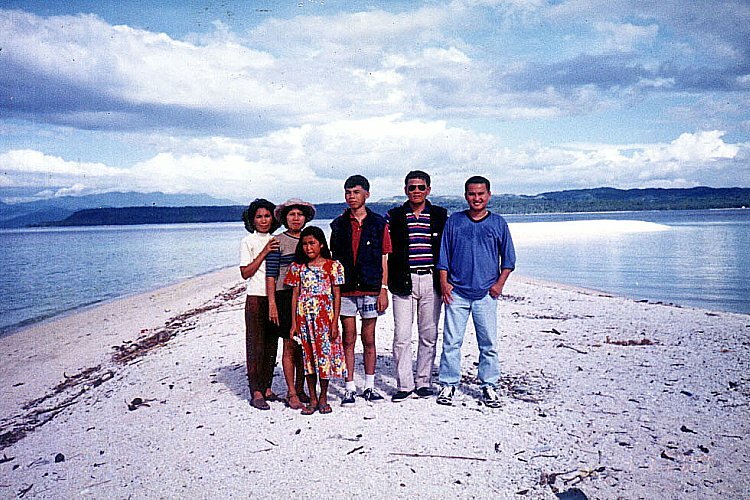 Higatangan Island is memorable to the late Pres. Ferdinand E. Marcos. On November 1943, Fidel Limpiado and his family provided refuge and saved the life of Marcos, a guerilla leader. Together with his eldest son Ranulfo, they ferried Marcos from Higatangan to Manorabe, Sorsogon in a sailboat, eluding Japanese Navy patrols. They were, however, caught in a typhoon and were stranded in Camandag, Sto. 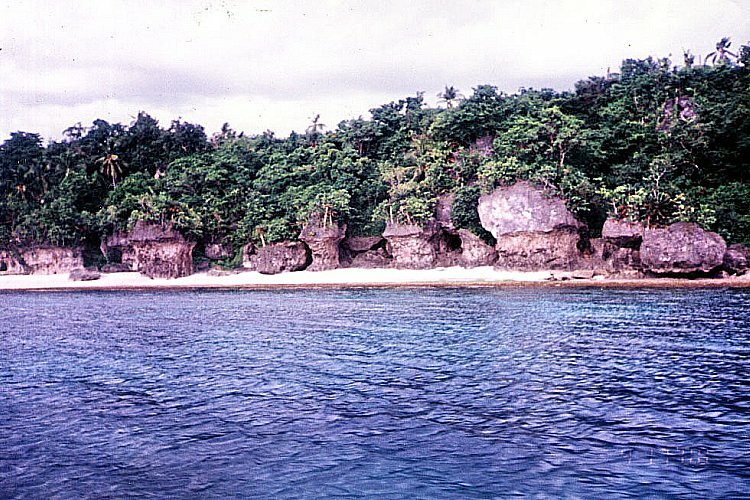 Nino in Samar. The rest is history. On May 10, 1978, a grateful Marcos, now president of the Republic, together with First Lady Imelda Marcos and daughter Irene, visited Fidel and granted his requests. 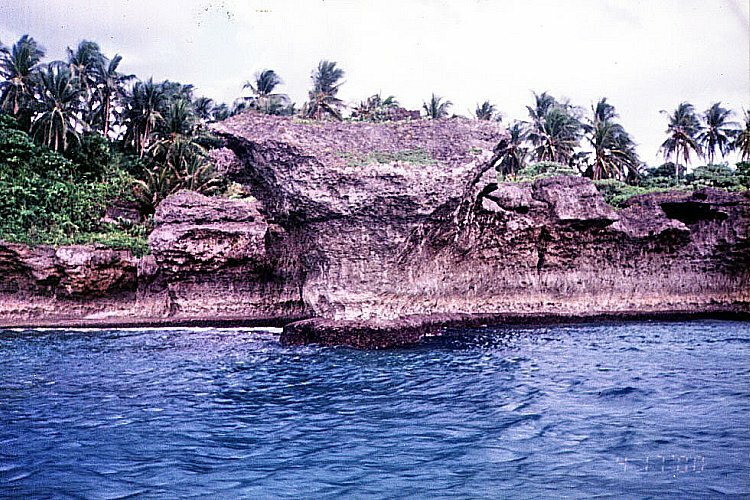 The island was declared as a tourist spot. Higatangan High School was opened immediately and a 9-km. circumferential road, post office, medical clinic and 4 windmill-powered water systems were also built. Today, a hill is named after the late president and it offers a panoramic view of Samar, Leyte, Cebu and Masbate. 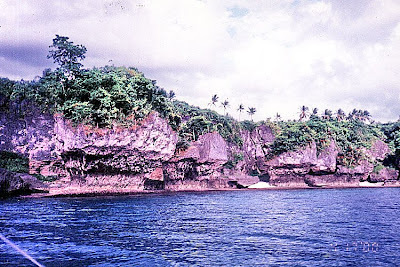 It was getting late in the afternoon, and since there was no regular return trip to Naval, Bebie offered to look for a boat willing to take us back to Naval. And off she went, looking for a certain Linda. In the meantime, we all returned to the inn for an invigorating shower, packed our things and waited at the picnic hut for our boat. The same boat that ferried us to the island, now empty, soon arrived and docked near the sandbar. They offered to bring us back to Naval for the cutthroat price of PhP700. 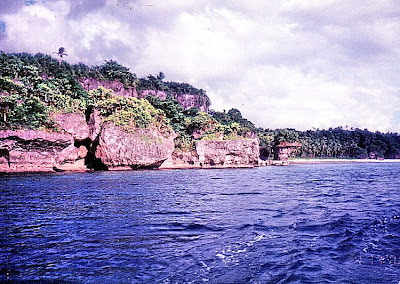 Before its arrival, we were able to meet Linda who agreed to accompany and tour us in her boat around to the western side of the island before going back to Naval. We settled on Linda’s price of PhP450. While waiting for the boat, we couldn’t help but notice that same strange Shakespearian character again talking to himself at the adjoining hut. We three were soon aboard the boat, together with Bebie, Linda and Linda’s daughter, when our boatman soon arrived. Lo and behold!!! It was our same, strange Shakespearean character! Noknok and I swallowed hard and started to pray …. So off we went. Our apprehension soon turned to admiration as we noticed how our boatman, incidentally and, somewhat unfairly, named Gunggung, handled our seemingly fragile craft. I was seated next to him and soon was the focus of all his senseless chatter. Later on, he was singing a ditty. Both chatter and song were in Cebuano. I took it all goodnaturedly. Later on, I learned that he had a wife and two children but was separated from his wife. Poor fellow. We soon rounded the island’s end and approached the island’s western side. It was a totally different story round here. Instead of endless white sand beaches, we were introduced to a surrealistic world of short stretches of beach punctuated by magnificent and grotesque rock formations topped by dense undergrowth, all products of the constant battering forces of wind and waves against these rock walls. Looking down at the sea, we were surprised to see how clear the waters were at this area. We could see, in great detail, numerous large corals as well as bright blue starfish. 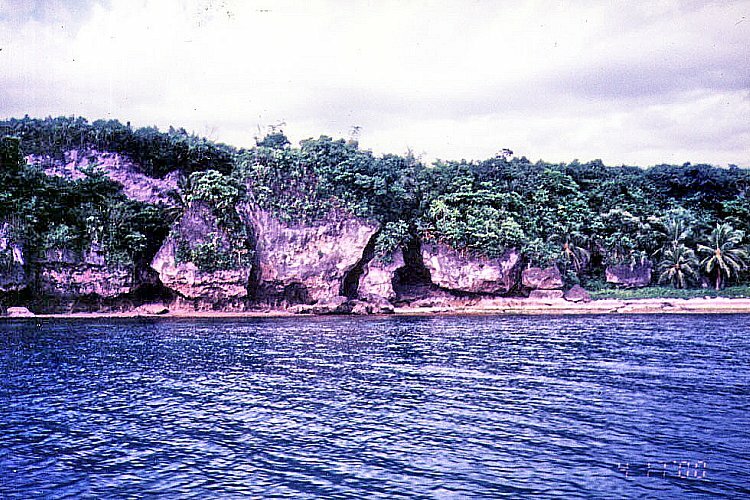 It has a good potential as a dive site. 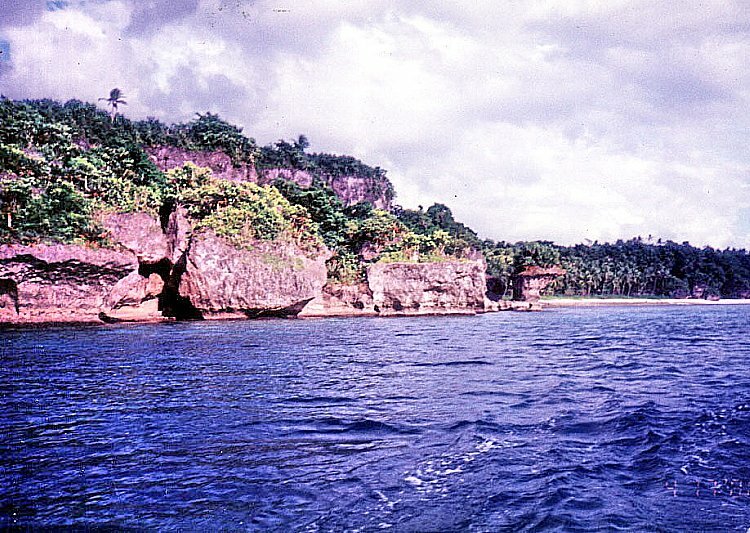 After about 30 mins., we finished circumnavigating the island and soon headed back for Naval. Our trip was uneventful for the next half hour. It started to rain and Jandy took to wearing a raincoat supplied by Linda. Pretty soon, the waves became choppy and Jandy was screaming with every high wave that lifted the banca. I took it calmly (I’ve seen worst during an excursion in Calapan City, Mindoro Oriental), trusting in Gunggung (and in God) as he capably rode the banca through the waves. Noknok later told me that, this being his first time in such a situation, this prodded him to pray to God, and all the saints for that matter, for deliverance. The choppiness ceased as we neared Naval. Pretty soon, Naval harbor came into view and we breathed a sigh of relief. We, including Linda, were so engrossed with relief that we failed to notice that Gunggung didn’t cut the engines to slow down the boat. We hit the shore with a crash, almost knocking us off our feet and into the now shallow shoreline. There’s nothing like ending our trip with a bang! Gunggung inspected the boat and reported no damage to the boat’s superstructure except for a crumpled propeller. I gladly paid Linda her fee plus an extra PhP50 for all her trouble, thanked her and Bebie and then parted ways. We took a tricycle back to the church, loaded our stuff and left Naval by 6 P.M.. We were back in Tacloban by 8 PM.